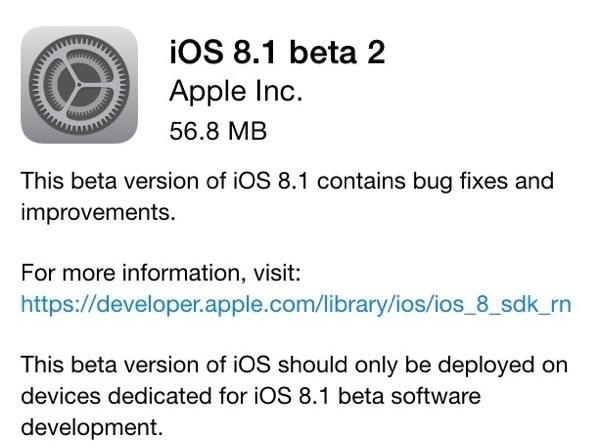 Shortly after Apple's iOS 8.0.1 update fiasco ruined many iPhone users' cellular reception (which was fixed with iOS 8.0.2), developers were treated to the first beta release of iOS 8.1, which will be the next big update for iPad, iPhone, and iPod touch. The first beta didn't bring about many changes; just a few small tweaks and the return of Camera Roll, which I personally missed. Now we've got round two, and iOS 8.1 beta 2 seems to be nothing but bug fixes. If you've been having trouble with Bluetooth connectivity, you're not the only one. Many users have been complaining about weak and lag-filled connections through Bluetooth with their speakers, headphones, and car units. Out of all the big fixes, this seems to be the biggest one and the one that's been plaguing most users. While there are no new features, or other big bug fixes, the following issues have been ironed out in iOS 8.1 beta 2. This update was nothing extraordinary, as it mostly served to fix some existing issues. Apple has also added support for Apple Pay, but it's hidden deep within the OS for developer testing, so you can't really do anything with it for now. Look for Apple Pay and the finished version of iOS 8.1 to be released later this month on October 20th, 2014 (if all goes well). Here at WonderHowTo, we've also seen traffic originating from devices running iOS 8.2 and iOS 8.3, so be on the lookout here on Gadget Hacks for all the new iOS 8 features when they drop in the coming months.